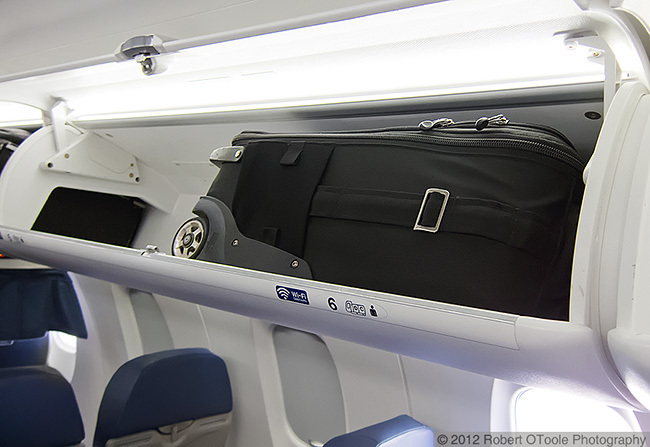 My Think Tank Photo International roller safely tucked away in a Delta/SkyWest CRJ700 regional jet overhead bin. This is why I travel with a international sized not domestic size roller. Crowded cabins and more and more people boarding with carry on bags means there there is more pressure than ever on photographers trying to keep their gear safe and sound. The very best way protect your camera and computer equipment is to keep it with you at all times and never check or gate check any camera, lens or computer. Earlier this week I flew RT from Los Angeles to Phoenix on a Delta CRJ700 regional jet. This jet is small but far from being the smallest out there but Delta/SkyWest tells everyone that roller bags will not fit on this flight and they will try to gate check every bag they see (this is okay since this means you will have more room for your gear on the plane). On the flight to Phoenix I approached multiple times by Delta staff trying to gate check my gear. Each time they told me my gear would not fit on the plane I told them that I appreciated the offer but I refused and explained quietly that I am a professional photographer and I have experience storing my gear on the type of plane I was booked on. The ground staff did not have any experience at all flying on this type of plane but they were confident that they were right. On the return flight I was able to satisfy the gate management staff by showing them images of my bags in the same overhead bin they are telling is too small for my roller. I like to photograph my roller and laptop bag stowed in various types of aircraft for future reference. Make sure you know ahead of time what type of plane you will be flying on. Contrary to what the airlines tell you gate checking is not safe so never give up and hand over your gear to airline staff at the gate. It can sometimes be difficult to avoid but over the last decade I have a perfect record. The Think Tank Photo Urban Disguise laptop bag and International roller combination has worked very well for me but there are a lot of good gear configurations out there that work well. See the links at the bottom of the post for more info on the Think Tank gear that I use and recommend. Over the next few weeks I will being posting a few more articles with tips and techniques to make life easier for you when you travel.